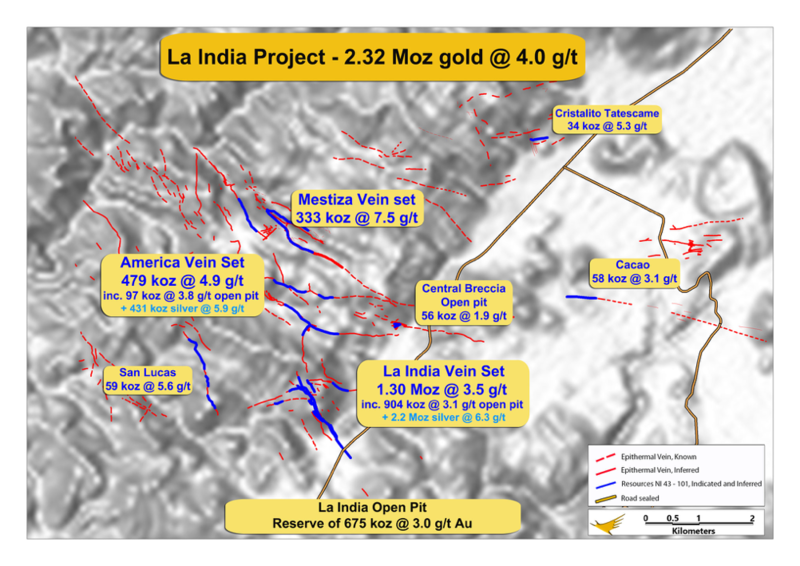 La India Project has a CIM-compliant combined Inferred and Indicated Mineral Resource of 18.1 Mt at 4.0 g/t for 2,32M oz gold and a Probable open pit Mineral Reserve of 6.9 Mt at 3.0 g/t for 675,000 oz gold. 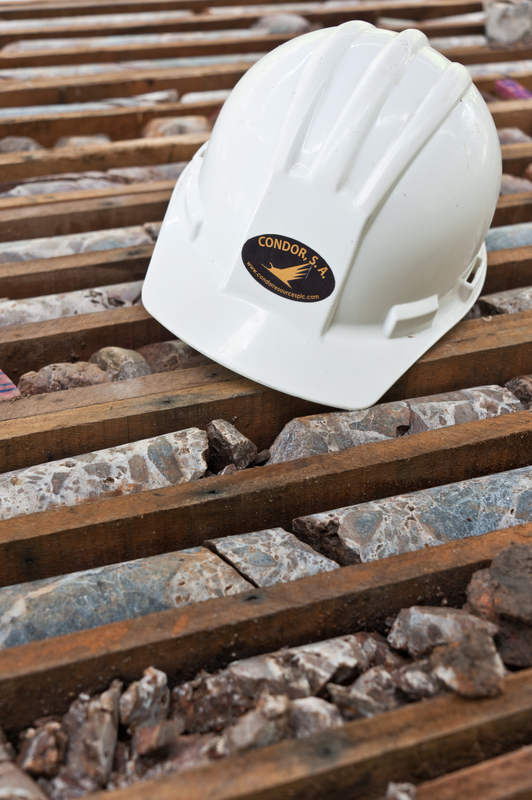 Condor holds 100% ownership of a 456 km² concession package covering 98% of the historic La India Gold Mining District. The concession package comprises eleven contiguous concessions. Seven of the concessions were awarded directly from the government between 2006 and 2018. 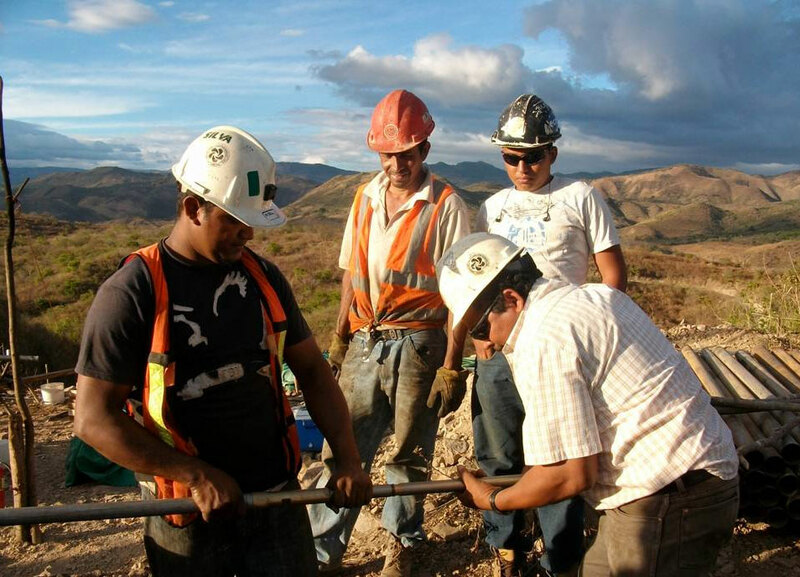 The remaining four concessions were acquired from other owners: the La India Concession was added to Condor’s portfolio in late 2010 through a concession swap agreement with Canadian miner B2Gold, the Espinito Mendoza, La Mojarra and La Cuchilla (formerly HEMCO-SRP-NS) concessions were acquired from private companys in 2011, 2012 and 2013 respectively. In August 2018 Condor received an environmental permit for the development, construction and opertion of a processing plant with a capacity of up to 2,800 tonnes per day and associated mine infrastructure at the La India Project. Following the grant of the Environmental Permit the Company’s objective is to progress the redesigned mine site infrastructure for La India Open Pit to a bankable level of Feasibility Study ("BFS"). In addition, under the conditions of the Environmental Permit, the Company has to submit to MARENA final engineered designs for several key components of the mine prior to construction. For example, the final design and operations manual for the Tailings Storage Facility. Subject to financing, completion of a BFS and completion of the final engineering designs, construction is expected to commence within 18 months of the grant of the Environmental Permit. The construction period is expected to take 18 to 24 months. Please click here for a map of La India Project. 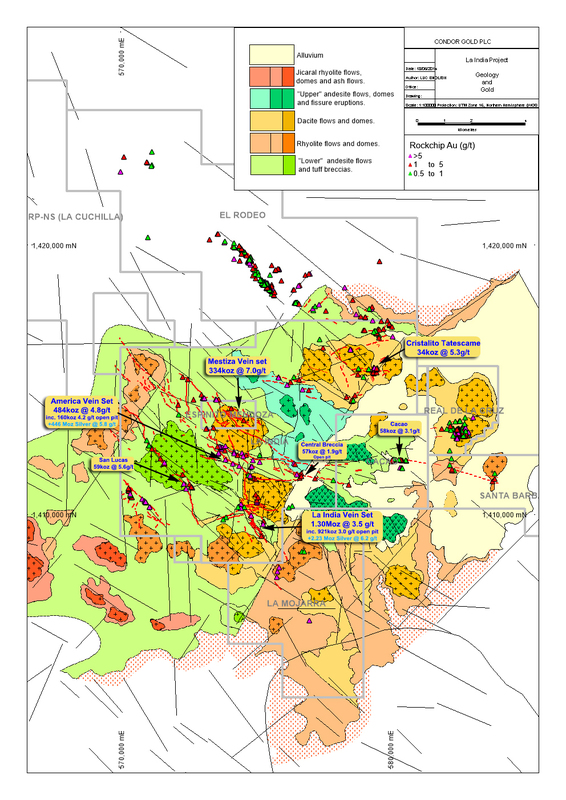 Please click here for a geological map of La India Project. The La India Project hosts the historic La India Gold Mine which processed an estimated 1.7Mt at 13.4g/t for 576,000oz Au between 1938 and 1956, the majority of the production under the ownership of Canadian mining company Noranda Inc. At the height of production in 1953, mine records show an annual production of 41,861 oz gold at a grade of 0.3442 oz/ton (11.8 g/t) and 39,282 oz silver (equivalent to 11.0 g/t). The mine worked a dozen narrow high-grade veins using traditional back-stoping techniques with mine drainage achieved and ore transport to a central mill achieved via an extensive network of interconnected drainage and transport adits. 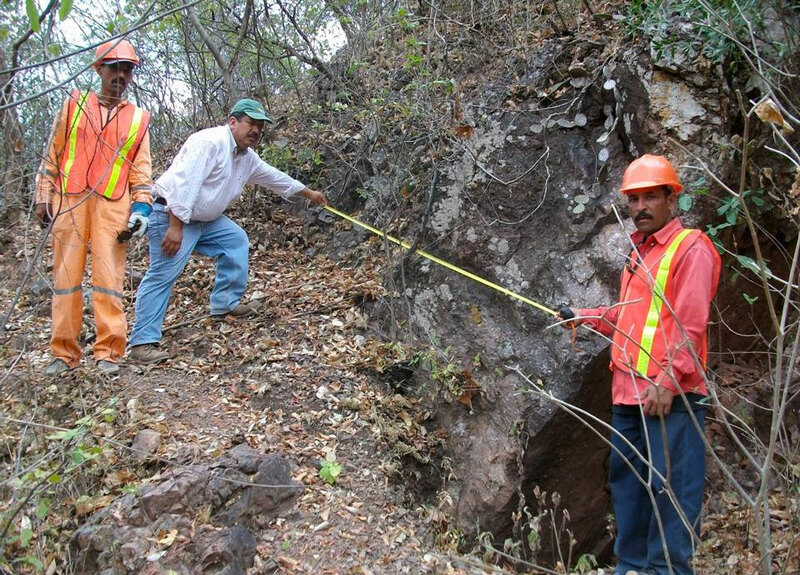 The mining was concentrated on two veins; La India vein where a 1200 m strike length was mined to a depth of up to 200 m below surface and the America-Constancia vein where a 2200 m strike length was mined to 250 m below surface. Mine development at these locations and at the smaller satellite workings was incomplete, and in some cases had not advanced beyond exploratory stope development, when mining was halted in 1956. 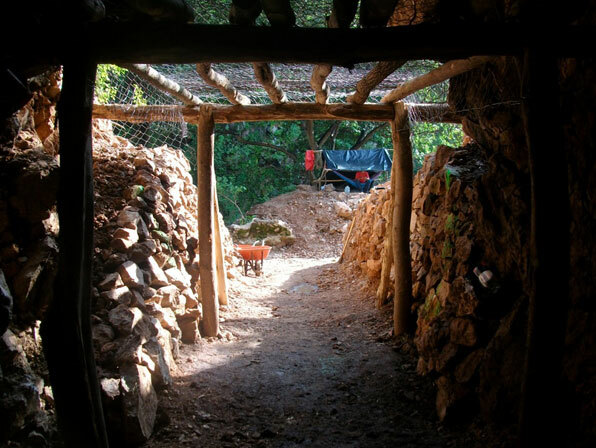 Since the closure of La India gold mine and continuing to the present day, artisanal miners have intermittently worked the most accessible upper levels of the mine and extracted ore from small pits throughout the district. 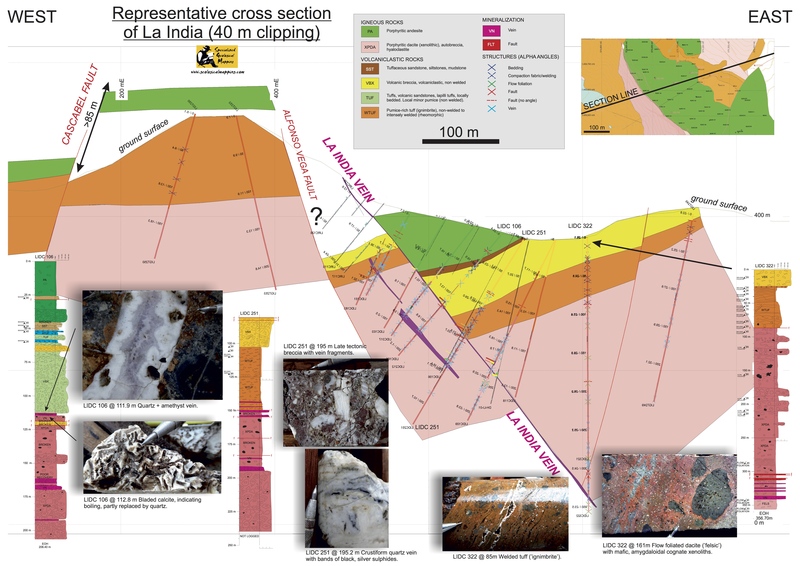 Tertiary aged island arc volcanic rocks host Bonanza-type low-sulphidation epithermal gold-silver mineralisation throughout La India Gold Mining District. 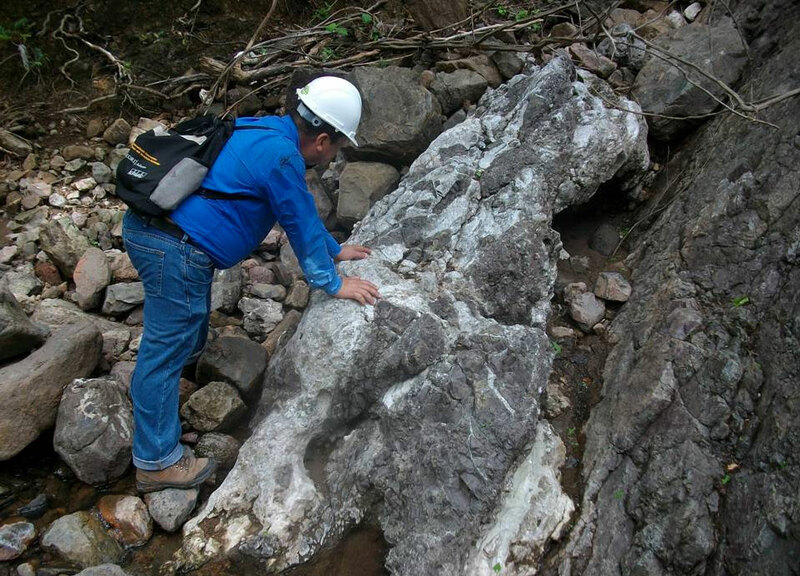 Over 17 km of gold mineralised quartz-carbonate veins have been defined to date, with intermittent gold mineralisation recognised at surface along structures adding several more kilometres. The veins vary in strike between a northerly, north-easterly and easterly direction reflecting emplacement under a tectonic regime dominated by the north-eastward directed subduction of the Pacific Tectonic Plate beneath the Nicaraguan landmass. The veins are low-sulphidation gold-silver epithermal veins with epithermal textures such as banding, brecciation, vugs and bladed textures recognised, locally reworked by faulting along the vein-hosting structure to produce brecciated quartz vein and fault gouge clay. 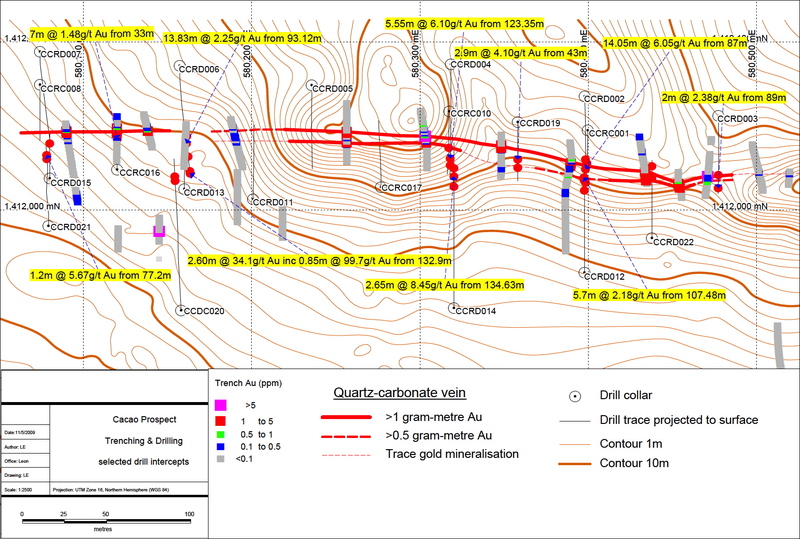 The gold is un-evenly distributed along the strike length of the vein as wide high grade shoots separated by narrower, lower grade veins, with the gold hosted by quartz veins. Three principal vein sets have been explored to date; the La India, America and Mestiza vein sets all located within a 6km by 3km area. 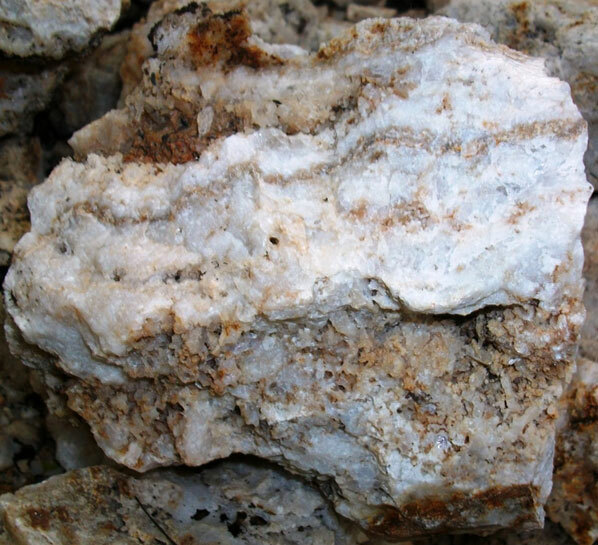 At La India wide zones of gold mineralisation have been recognised where stacked quartz veins and quartz breccia form high-grade zones up to 25m wide. The high grade shoots typically extend for 100m to 300m along strike and the intervening low-grade zones appear to typically extend between 50m and 150m along strike. A different style of gold mineralisation was discovered by Condor geologists on the edge of a major late-stage northeast striking fault in 2011. The Central Breccia prospect is interpreted as a breccia pipe and is characterised by wide zones of jigsaw-fit chlorite-altered andesite cemeneted by silicified microbreccia and crystalline calcite. The breccia has an anomalous background gold mineralisation of 0.1-0.2g/t gold within which high-grade zones, typically over 10m thick and grading between 2g/t and 7g/t gold occur. The high-grade zones are often associated with sulphide mineralisation and intense argillic alteration. 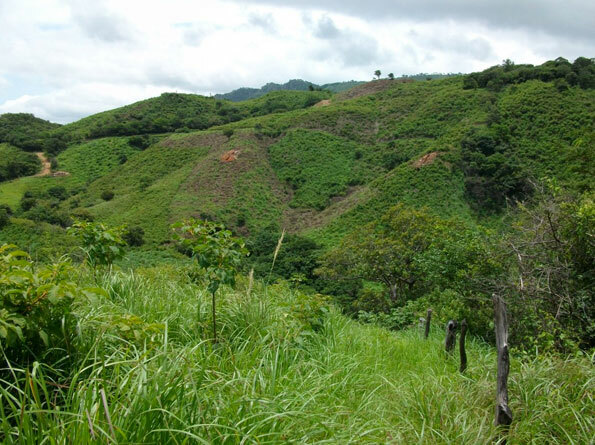 Modern well documented exploration dates from the period between 1986 and 1990 when extensive trench sampling and some wide spaced drill sampling funded by a Soviet-Nicaraguan government collaboration led to the definition of a Soviet GKZ style C1+C2 category resource of 2.9Mt at 9.6g/t for 914,000 oz gold and additional Soviet GKZ style P1 category resource of 4.9Mt at 9.2g/t for 1.44M oz gold within the La India Concession. Subsequent exploration by a number of Canadian exploration and mining companies, and more recently by Condor has confirmed the high grades estimated by the Soviets on La India Concession and identified numerous new gold mineralised veins located further from the historic mining centre of the India and America-Constancia veins. 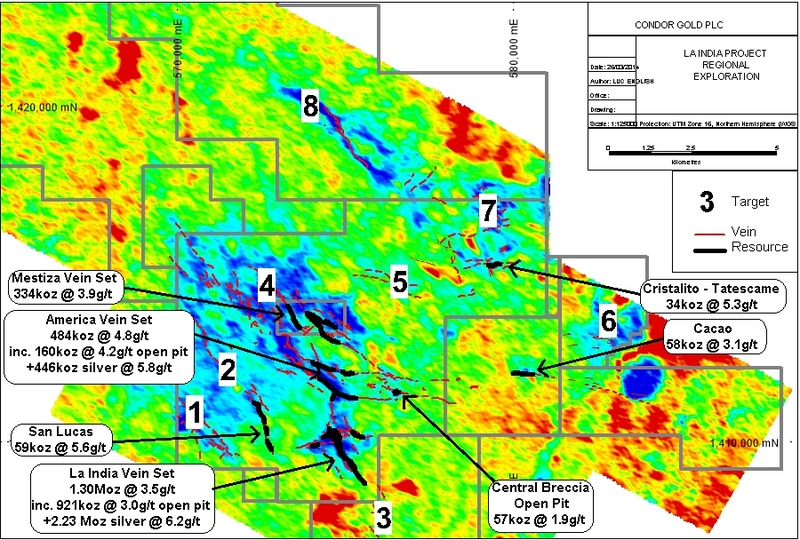 In 2007-2008 Condor drill-tested a 600 m long segment of one of these newly discovered veins, the Cacao Vein which currently contains a JORC/CIM compliant inferred mineral resource of 0.59 Mt at 3.0g/t for 58,000 oz gold (announced October 2011). Please click here for a plan of Cacao Prospect. Please click here to view Cacao cross-section. In late 2010 Condor undertook a major data capture programme to collate all historic data from the numerous companies into a single database for all veins. 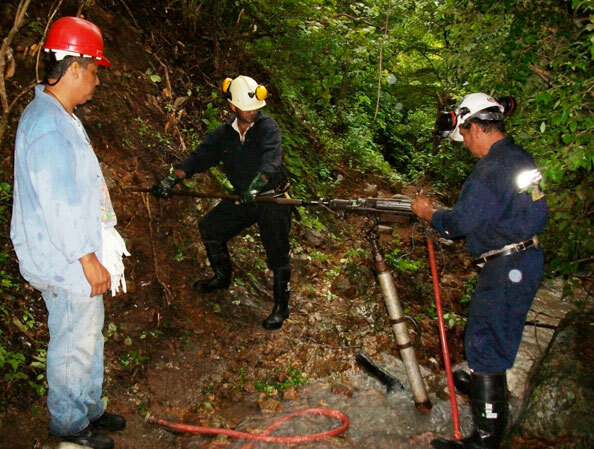 The exploration database includes some 135 drillholes for 17,600 m, 736 trenches for 10,900 m and 9,000 original underground mine grade control samples on eight of the veins. This data capture process is ongoing but at present over 90% of the available historical data has been captured. From 2011 to August 2017 Condor drilled 397 drillholes for circa over 59,000m and over 18,000m of trenching. This data was combined with the historic exploration and mining data and included in the latest mineral resource estimate completed by independent geologists at SRK Consulting (UK) Ltd and announced in January 2019. The current mineral resource estimate on the project area is prepared in accordance with NI 43-101 comprising an indicated mineral resource of 9.85Mt at 3.6 g/t gold for 1.140M oz gold and 5.9 g/t for 1.88M oz silver and an inferred mineral resource of 8.48Mt at 4.3 g/t for 1.179 M oz gold and 8.2g/t for 1.201M oz silver, all contained within a 9km radius within the La India Project area. The CIM-compliant Mineral Resource Statement was reported to NI 43-101 guidelines by independent geological consultants SRK (UK) Ltd and signed off by SRK's Ben Parsons, a Competent Person as defined by the CIM Code. Towards the end of 2013 SRK Consulting (UK) Limited was commissioned to undertake a prefeasibility study (“PFS”) and updated preliminary economic assessments (“PEA”) to determine whether La India Project could support an open pit only mine for several years, with underground development funded at a later date out of cash flow. The study considered three different scenarios: a prefeasibility study on open pit mining at La India only; a PEA on open pit mining on La India, America and Central Breccia; and a PEA on open pit mining at La India, America and Central Breccia and underground mining at La India and America. In November 2014 the combined PFS and PEA study was completed. (1) 0.8Mtpa PFS La India Open Pit only demonstrates a robust and economically viable base case for the project. The study envisages Open pit mining of 6.9Mt of ore at 3.0g/t gold with a 91.0% recovery for 614k oz gold production. The Life of Mine (“LOM”) stripping ratio is 13.6 t:t over a mine schedule of 8 years producing 94.5Mt of waste. The mining rate will be 0.8Mtpa over 8 year mine life feeding a 2,300 tpd plant for an average annual production of 79,300 oz over the 7 years of maximum production. The LOM all-in sustaining costs are US$690/oz, the capital expenditure is US$110M, the Internal Rate of Return (“IRR”) is 22% and the Net Present Value (“NPV”) is US$92M. (2) 1.2Mtpa PEA Scenario A, La India Open Pit + Feeder Pits. Open pit mining of 9.5Mt of ore at 2.8g/t gold with a recovery of 91.0% for La India, 94.5% for America and 87.0% for Central Breccia, to return 774k oz gold production. The LOM stripping ratio is 12.5 t:t over a mine schedule of 8 years producing 118.2Mt of waste. The mining rate will be 1.2Mtpa feeding a 2,800 tpd plant for an average annual production of 96,800 oz gold. The LOM all-in sustaining costs are US$685/oz, the capital expenditure is US$127M, the IRR is 25% and the NPV is US$124M. (3) 1.6Mtpa PEA Scenario B, La India Open Pit + Feeder Pits + Underground. Open pit and underground mining of 13.0Mt of ore at 3.2g/t gold with a recovery of 91.0% for La India, 94.5% for America and 87.0% for Central Breccia, for 1.2M oz gold production over a 12 year mine life. The open pit component will be completed in 8 years with a LOM stripping ratio is 12.4 t:t producing 118.2Mt of waste. The mining rate will be 1.6Mtpa for the first 8 year mine life feeding a 2,800 tpd plant for an average annual production of 137,500 oz. After Year 8 mining will switch to a lower rate extracting underground ore only for a further 4 years. 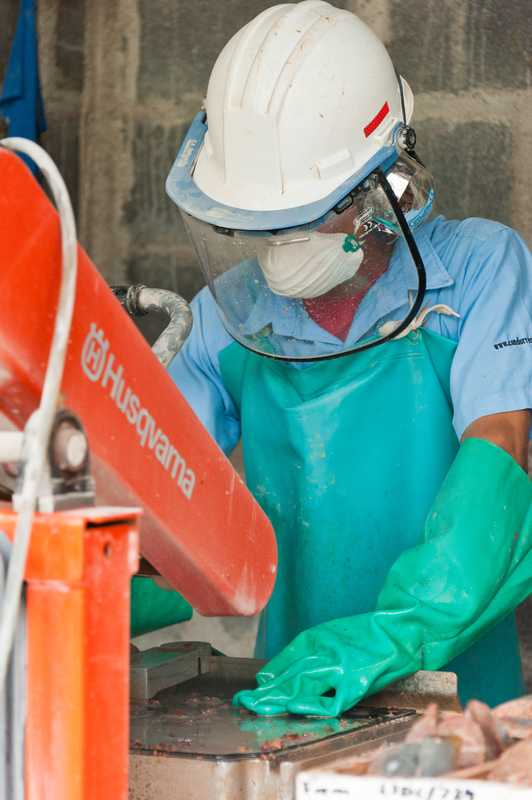 Underground mining will use cut-and-fill method assuming 5% dilution and 95% mining recovery. The underground component accounts for 3.52Mt at 4.31g/t gold. The LOM all-in sustaining costs are US$697/oz, the capital expenditure is US$169M, the IRR is 24% and the NPV is US$187M. 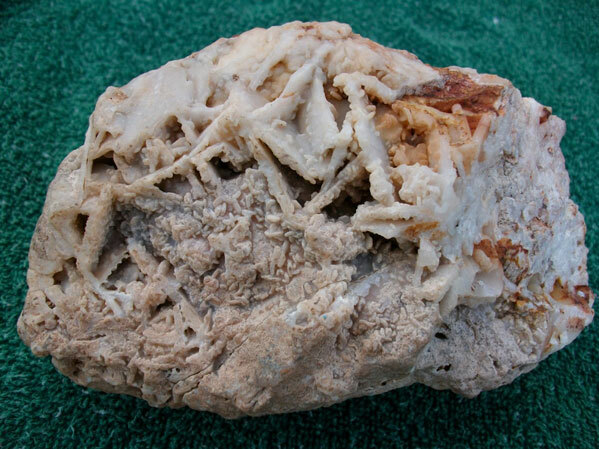 San Lucas - Capulin vein, La India District. America vein, La India District. 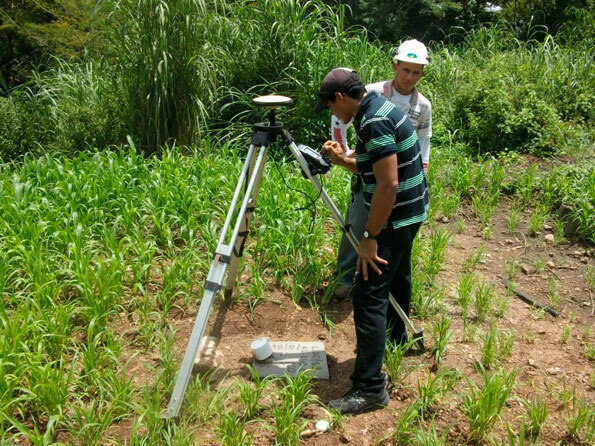 Drill hole surveying, La India District. 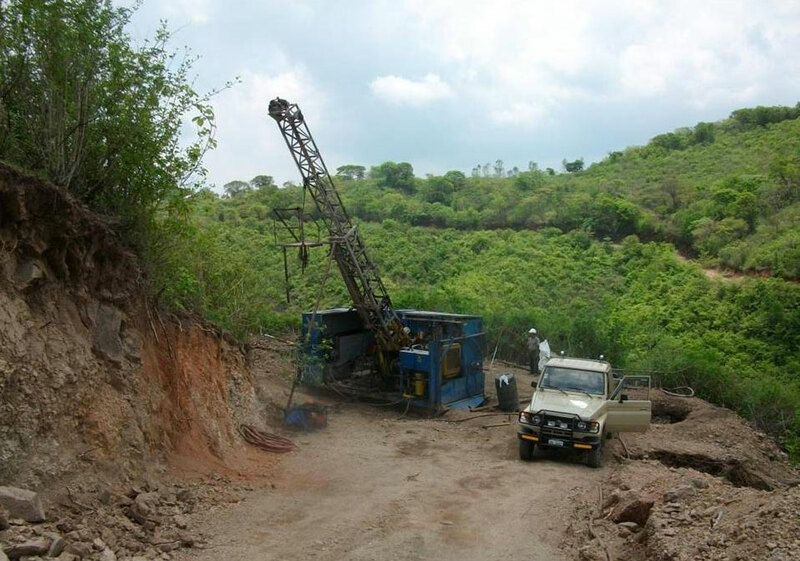 Diamond drill hole 40, La India District. 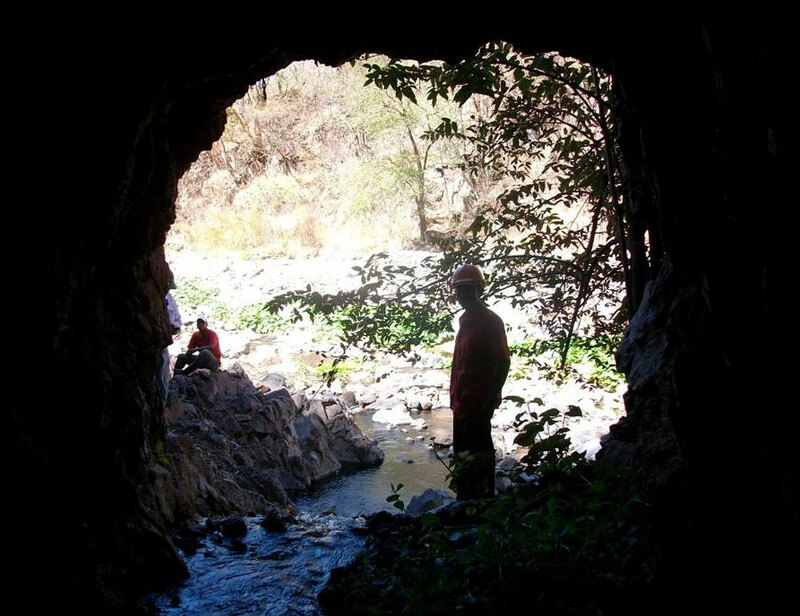 Historical mine drainage adit - San Lucas vein, La India District. Drill core showing a wide zone of gold mineralised quartz breccia from La India Vein. Regional exploration targets (numbers) and current mineral resources on a radiometric Thorium:Potassium base - high potassium relative to thorium coloured blue. 1=Dos Hermanos; 2=San Lucas; 3=La Mojarra; 4=NW extension of India-America and La Mestiza; 5=El Tanque; 6=Real de La Cruz; 7=Tatescame; 8=Andrea. Vertical long-section of the La India Vein southern high-grade shoot. 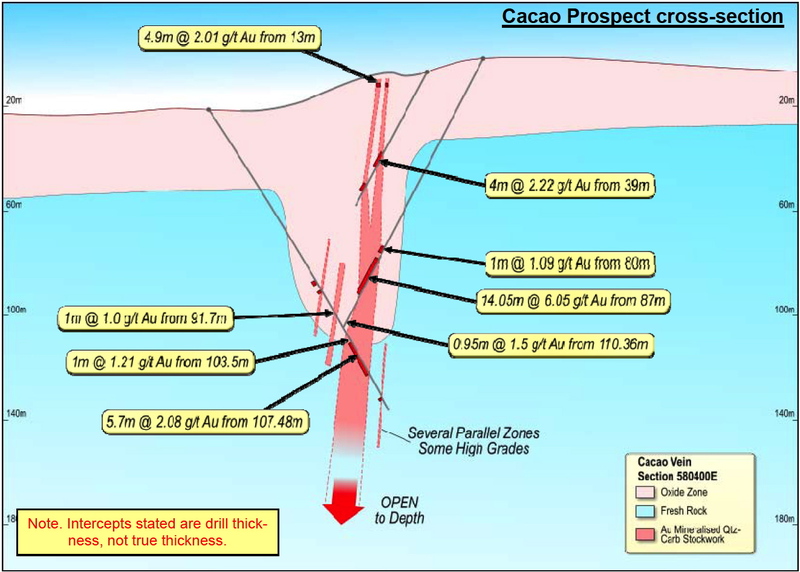 Gold mineralisation remains open to depth and along strike at depth. 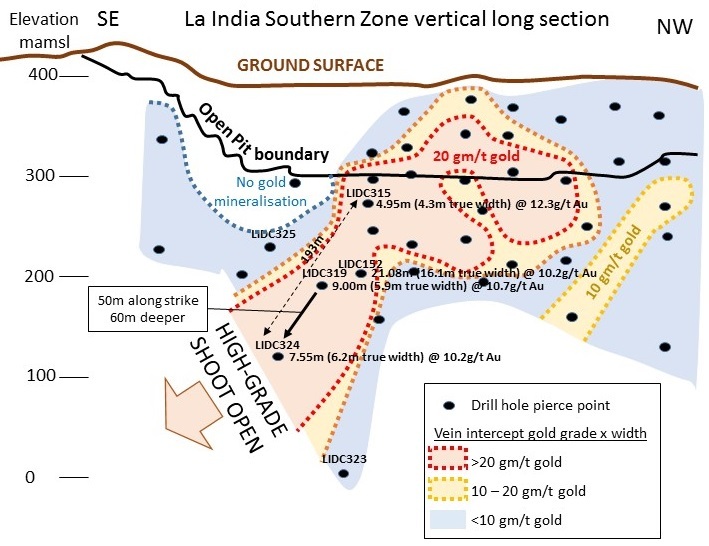 La India preliminary economic assessment Scenario's A and B open pit combined indicated and inferred mineral resource of 8.1Mt at 2.8g/t for 737,000 oz gold (Dec 2014).